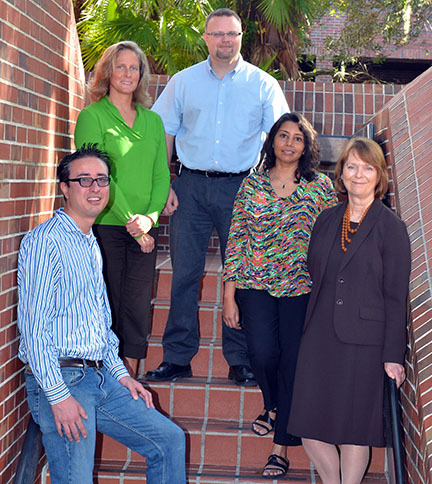 Faculty members of the College of Education’s online education technology master’s degree program include, from left to right, Albert Ritzhaupt, Kara Dawson, Pavlo “Pasha” Antonenko, Swapna Kumar and Carole Beal. The UF College of Education’s online master’s degree program in education technology – which provides education professionals with the knowledge and expertise needed to use educational technologies to improve learning and performance in face-to-face, online and blended environments — has joined the COE’s education leadership online graduate program on a list of top 10 rankings nationwide. TheBestSchools.org, a higher education website for college information seekers, recently placed the education technology program at No. 9 on its list of “The 25 Best Online Master in Educational Technology Degree Programs” — just weeks after giving the COE’s education leadership program a No. 5 ranking in its specialty area. The site also ranks the University of Florida’s overall distance learning program at No. 2 in the nation behind the Penn State World Campus. Rankings for the two online master’s programs are based on academic excellence, range of available classes, faculty strength, other rankings and reputation. Meanwhile, education leadership faculty member Bruce Mousa, who helped establish the online education leadership master’s degree program two years ago, has been using his program’s No. 5 ranking as a marketing tool. “We tell everyone that we’ve got a flexible, online course that maintains high standards set by UF,” said Mousa, whose program prepares working teachers and other professionals to become school principals. The complete rankings can be found online at http://goo.gl/mrRzKZ. Source: Albert Ritzhaupt, UF associate professor of education technology; phone (352) 273-4180; aritzhaupt@coe.ufl.edu.